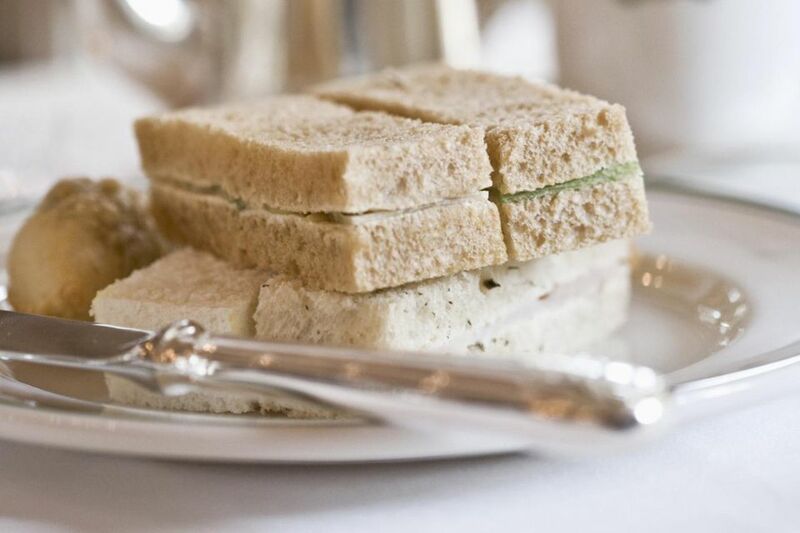 Tea sandwiches (also known as "finger sandwiches") are small, crustless sandwiches that can be consumed in a few bites. They are often paired with teas, scones, and other foods during afternoon tea ('high tea' or 'low tea,' if you prefer). These tasty little sandwiches can also be enjoyed as a snack without tea or as a healthy treat for a fun kids' party. While there are traditional English tea sandwiches, these morsels can take on a great variety of flavors. From refreshing cucumber to egg salads and elegant uses of fancy cheeses, they're easy to prepare and a delight to share with family and friends. Cucumber tea sandwiches are classic finger sandwiches that are usually made with white bread, butter, cream cheese or mayonnaise, and cucumber. Be sure to peel, seed, and slice the cucumber before adding it to any of these delicious bites. Use white bread in this classic cucumber tea sandwich recipe for a very traditional afternoon tea finger sandwich. Cucumber mint sandwiches are a refreshing, summery variation on traditional cucumber sandwiches. You will find that cucumber and cream cheese finger sandwiches are light and cool enough for the hottest of summer days. Salmon tea sandwiches are typically made with thinly sliced smoked salmon (or lox) and dark bread. Whole wheat, pumpernickel, dark rye, and other seeded, grainy breads are the most popular. This smoked salmon and cream cheese finger sandwhich recipe proves that lox and cream cheese aren't just for bagels. Salmon and cucumber tea sandwiches combine two popular finger sandwich ingredients into one delicious recipe. Egg salad finger sandwiches are excellent additions to afternoon tea meals. They are hard to resist and easy to prepare ahead of time, which takes some of the pressure off your hosting duties. At Harrods in London, watercress egg salad tea sandwiches are a must try and this recipe is very similar to their classic tea sandwiches. Simple in preparation and in flavor, these simple egg salad finger sandwiches are easy to whip up for a crowd of picky eaters. Use this egg salad spread for quick egg salad finger sandwiches. Just spread it on white bread, remove the crusts, and slice the sandwich into four triangles. Chicken and tuna salads are also popular finger sandwich spreads. Including at least one of these recipes adds a little variety to tea time. This chicken salad spread is a simple base for chicken salad finger sandwiches. With a thin-sliced bread, you can adapt this parmesan tuna salad sandwich recipe into tasty finger sandwiches. Cheese and veggies are an ideal combination for tea sandwiches and these tasty little treasures are sure to satisfy all of your guests. Perhaps the most versatile and kid-friendly tea sandwich recipe in the collection, this veggie cream cheese tea sandwich recipe is sure to please. Pimento cheese sandwiches can be spread thin and sliced for Southern-style tea sandwiches.